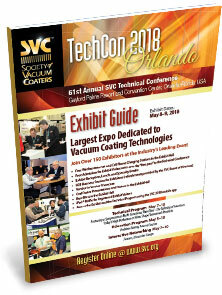 The TechCon Exhibit Guide (TEG) showcases the products and services of exhibiting companies participating in the annual SVC TechCon Exhibit. It also highlights the Technical Program, Education Program, and various networking events. This is a unique opportunity for exhibitors to promote their presence at the TechCon Exhibit. The advance, first class mailing of the Guide will go to thousands of potential visitors working near the TechCon location. The digital version of the TEG is sent to all SVC subscribers on a worldwide basis. This enhanced digital version offers viewers direct hyperlinks to advertisers, easy navigation and searchable content. Advertising in this Guide is an excellent opportunity for your company to emphasize the services it offers to the vacuum coating community.